Could China Work With Germany to Solve Ukraine Crisis? Germany’s engagement with China over Ukraine raises the possibility for Beijing to back diplomatic talks. According to the Xinhua statement as well as a statement from German government spokesman Steffen Seibert, it seems Germany and China have reached a basic agreement on the Ukraine situation: namely, that both support a settlement through dialogue, and both hope that international laws will be upheld. However, Germany has gone much farther than China in laying out a firm position. In his statement, Seibert said that Germany believes the planned referendum in Crimea is against international and Ukrainian law. Seibert also blamed Russia for stonewalling attempts to reach a political solution through dialogue. “The Russian side has not yet shown the necessary will to enter into a process of this sort,” the statement said. Germany has been reluctant to join with the U.S. in imposing sanctions on Russia. “Punishment is not a category that applies to foreign policy,” a German official told reporters. Though the U.S. and Germany differ on the means, in terms of a desired end to the Ukraine crisis Berlin and Washington are “on the same page,” the same official said. 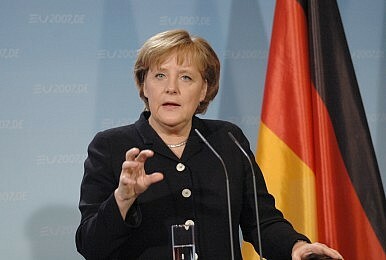 But still, the differences between them may help Germany to play a role as mediator. It would be almost politically impossible for Putin and Obama to work out a solution, but Merkel might be able to bridge the gap between them. Interestingly, Germany could also make it more desirable for China to work with the West over Ukraine, or at least lend its support to a German-backed dialogue mechanism. Both geostrategically and in terms of general foreign policy outlook, China is predisposed to favor Russian positions over the United States’. China’s recent press conference have reflected this—while not offering concrete support for Russia, China’s Foreign Ministry spokespeople have gone out of their way to avoid saying anything that could be construed as criticizing Russia. However, it’s also dangerous for China’s leaders to be seen as backing separatism or even self-determination for various ethnic groups, given the issues in Tibet and Xinjiang. Germany could help provide a way out for China. China-U.S. ties are always plagued by distrust and competition, no matter what new initiatives are put forth. But China’s relationship with Germany, especially in economic terms, is doing quite well. In 2012, bilateral trade between Germany and China was worth nearly $70 billion, with Germany enjoying a trade surplus. Xi is scheduled to visit Germany later this month as part of a Europe tour, where he hopes to further strengthen China-Germany cooperation. China has also repeatedly held Germany up as a positive example of facing up to World War II aggression, with Japan serving as a negative counter-example. Given the background, cooperating with Germany to jump-start a dialogue on the Ukraine issue would not be anathema to Chinese policymakers the way joining with the U.S. to chasten Moscow would be. While Chinese media outlets (and sometimes government officials) speak about “the West” as a monolith, each “Western” nation has its own agenda and philosophy—and Germany’s is generally more palatable to China than the United States’. Particularly if Germany maintains a fairly moderate stance, rejecting sanctions while calling for dialogue, China could express support for German-backed negotiations while still avoiding criticizing Russia. Don’t look for China to condemn or criticize Russia, but if Beijing can find a way to play an active role in seeking peaceful resolution without upsetting Moscow, it could boost China’s diplomatic prestige. Foreign Minister Wang Yi said in his recent press conference that China “will be more active in playing the role of a responsible, big country.” Helping solve the Ukraine crisis rather than standing on the sidelines would signal China is taking this new policy seriously. The solution involves realistic goals, trust building, and the willingness to walk away.